Keeping up with new tech is important, and it can be easy to get lost in all the latest tech news. So you don’t get behind, this Tech Tuesday we’re looking at all the latest announcements from yesterday’s Apple WWDC 2016 keynote. The conference started out with a reminder of the 100+ developer labs planned for the rest of the week. The thousands of attendees had great energy, the youngest being a nine-year-old girl. The announcements started right away with an overview of the changes coming to the Apple Watch. First up was Scribble, a new messaging option that allows you to trace letters on the watch face, which the watch turns into text for a quick response. During the demo, the Apple Watch was able to use Scribble to recognize and type Chinese characters, even when the watch’s language setting was English. There are plenty of new watch faces to choose from, including a minimalist face, and you will have the ability to swipe between different options. A new SOS feature means you can call emergency services no matter where you are, just by holding down a button. The Apple Watch knows your location, and can automatically call the correct emergency number, even if you’re traveling in a foreign country. Not only that, but it can also send a message with a map of your location to your emergency contacts, and display a medical ID tag so paramedics know if you have any conditions or allergies. 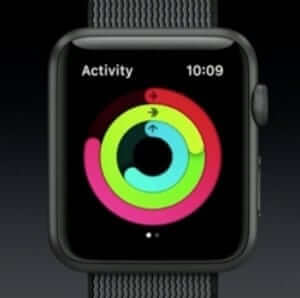 Fitness will become more interactive on the new Apple Watch, allowing you to view activity circles for friends and family, and even send smack talk for some friendly competition. Fitness will also include a new setting for wheelchair users that has been specifically designed to track the different arm movements used for different speeds and terrains. Last but not least, Breathe is an app designed to help the user in relaxation deep breathing exercises. You can set times to practice deep breathing, follow along with the graphics to time yourself properly, and check your heart rate to see progress. Apple TV’s time on stage at WWDC was brief, and beyond the new channels that are being added, the main announcement for Apple TV was single sign-on. This means that once you’ve authenticated your identity on the Apple TV by signing in, you gain access to all of your apps such as HBO Go or fyi, without having to sign into the apps. Next up was the main event: a look at the latest operating system for Macs. Instead of calling it OS X, Apple rebranded it as macOS with this location name being Sierra. On the new macOS, you’ll be able to use Tabs for all apps for better organization, and use storage optimization suggestions to free up more room on your hard drive. The system works together with your iCloud Drive to store old files only on the cloud, freeing up space on your disk. The iCloud will also now be able to access your desktop files, so you can have your most important items wherever you are. Another user-friendly feature is AutoUnlock, or one time authentication for devices. Now, if you’ve authenticated yourself on your Apple Watch or iPhone, your Mac will communicate with those devices, know that it’s you, and automatically unlock your screen. You’ll also be able to use Universal Clipboard to copy and paste between devices. Just hit “copy” on your iPhone, and when you click “paste” on your Mac, the same information pops right up. Apple Pay for Mac purchases was introduced with an entertaining photo of a woman using her desktop at a coffee shop, although the real Apple Pay is a lot less cumbersome. The desktop version is designed to help make online shopping even easier, pairing with the Apple Pay on your phone for quick, secure authentication. If you want to order food from your laptop, the confirmation sends to your phone, and you can confirm your purchase using the fingerprint ID. Siri is making a move to desktop, and after making a sassy Windows joke, proved just how helpful she can be outside of the iPhone. After helping search for specific files with specialized parameters, Siri showed off her messaging abilities, played power ballad music, and searched the web for image files. You can even pin Siri results to your Notifications or drag them into a document. The last big announcement for Siri: she’s open to developers now. Up next, iOS 10 proved to be worth waiting for with a lot of changes across the board. Voicemails will have transcriptions of messages, so you can see what a voicemail is about before you listen. Maps received some well needed updates allowing it to be more proactive when helping you with directions, by recognizing routes you often take. Another interesting feature is using apps within Maps itself. If you’re using Maps to get to a restaurant, you can make reservations using other apps like OpenTable through the Map app on your phone. You can even book rides with services like Uber. Maps too is open to developers, so the App Store will soon have plenty going on. Home is a HomeKit app for controlling smart devices in your home, include several new devices like security cameras, door bells, and even air purifiers. You can use “scenes” to control multiple devices at once. For example, you can set a scene for when you go to sleep that locks your doors, turns off your home lights, closes the window shades, and adjusts the thermostat - all with one tap. Apple Music has been reworked to include a simple design and an integrated music library. Recently added music now shows up in a separate section, and song lyrics are included with the rest of the song information. Daily curated playlists suggest songs to you based on the day of the week and your personal preferences. Messages has plenty to look forward to and will be like an entirely new app. Links will now show previews of content, and videos and music can even be played within the Messages app. Apple added bubble effects so you can respond with an excited text bubble that slams down, or a gentle bubble that appears normally. Additionally, “invisible ink” messages will allow you to send surprise text, photos, and videos - just hold your finger down to see what you were sent. You will be able to send handwritten messages, use full screen effects like fireworks or balloons, and write on photos and videos using digital touch. For the emoji lovers, Messages will highlight words that can be replaced with emoji, and give you the option of choosing if there are multiple that apply. 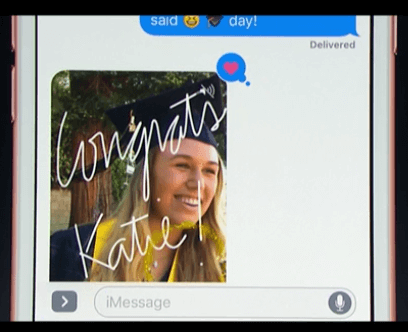 Like many other apps, Apple announced that Messages would also be open to developers to work with. iOS 10 is now open to developers, and the beta starts in July along with Sierra’s, with an upgrade for users in the fall. Lastly, Apple talked about the success that their open source programming language Swift has had. Adoption jumped after it went open source, and prompted Apple to continue opening resources to coders. Their latest contribution is a free iPad app called Swift Playgrounds, an interactive tool designed to teach the basics of coding. While some of the graphics are aimed towards children, the program itself is great for any age. The hope is that by making the app free, schools will especially take advantage and teach coding in the classroom. All in all, there was plenty to talk about during the two hour keynote at WWDC. Despite the crowd’s uncoordinated rap attempt during the Apple Music demo, the presentation was fun to watch and follow along. I’ll definitely be looking forward to the updated Messages features, appreciate the ease of use of Scribble for Apple Watch, and can’t wait to use the Universal Clipboard for easier searching, writing, and link sharing. If you’re a developer, check out all the great tools that Apple opened up to you this week! Wanting to get started on a project today with a developer? Tell us what you need and we’ll find you the perfect match!